The water industry is facing unprecedented capital needs, needs which will largely be recovered through increased rates. Sitting between public utilities and the public are governing boards trying to make the right decision for their community and the utility. What information do governing boards need to approve a water rate increase? What are the most effective methods of communicating the need for a rate increase? These questions guided a survey of city and county mangers and chief elected officials conducted by the Environmental Finance Center and ICMA. The survey was conducted as part of a larger project designed to identify and develop communication strategies that utility staff can use to gain support during the rate approval process. Ultimately, 1,408 “Chief Administrative Officers” (city and county managers, as well as utility directors) and 328 “Chief Elected Officials” (mayors and chairmen) of local governments that manage and set rates for water utilities completed surveys. Two hundred and two (202) of the surveys returned “matched.” In other words, a staff member and an elected official from the same local government completed the surveys. This “matched set” is a fun data set because it allows to compare two perspectives of the same situation (theoretically). Survey responses came from big (population > 250,000) through small (<2,500) water systems from across the country. The survey included questions about the level, frequency, and content of communication between the local government staff and its governing board regarding the water system, particularly when requesting an increase in water rates. The survey also collected information about the rate increase itself. How much was requested? Did the requested rate increase fully cover the costs of running the utility or did local government staff “low ball” their requests? And ultimately, did the governing board approve a rate increase? If so, did they approve what was requested? Overall, the survey found that water utilities are getting rate approvals for increased rates. Ninety percent of the local government staff reported that a rate increase was approved by the governing board when requested. And of the 804 water systems that requested a single rate request (as opposed to a range), ninety-one percent were granted the rate they requested. The difference came in whether or not the water utility asked for enough to begin with. The graph below shows summary statistics from the question on the local government staff survey. Are water utilities requesting the rates they need? 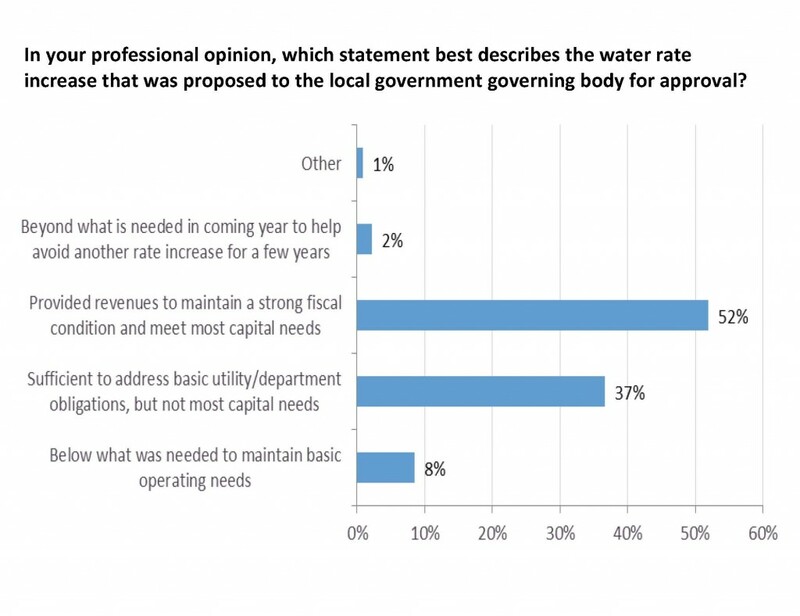 Over half (701 of the 1,349) of the survey responses said that the rate request would have provided revenues to maintain a strong fiscal condition and meet most capital needs. But forty-five percent of the respondents “low-balled” it. They either requested rates that would cover basic utility obligations, but not most capital needs or, worse yet, rates that wouldn’t even cover basic operating needs. What makes a utility more likely to request a full-cost recovery rate? 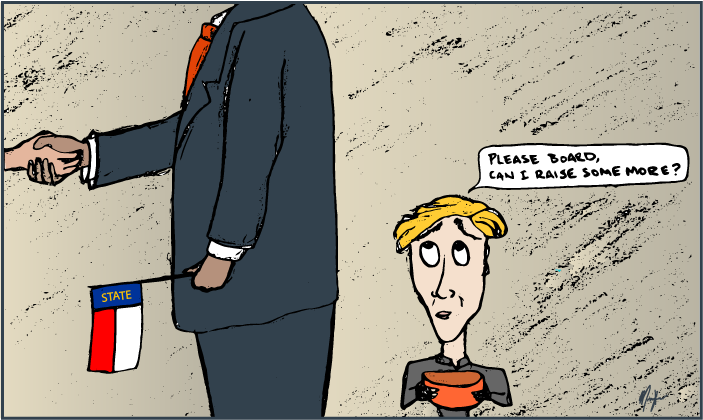 It comes down to trust (or the working relationship) between staff and the board. Local government officers that noted a better working relationship with the governing boards were (a) more likely to request higher rate increases and (b) more likely to request full-cost recovery rate increases. And according the elected officials, the effectiveness of a utility’s communication had a direct relationship with their perception of the working relationship between the board and top level administrators of the utility. Additionally, the frequency with which matters of the utility were discussed with the governing board increased elected official’s perception of the working relationship. Ultimately, water utilities are getting rate approvals. The issue is whether they are collecting enough revenue to cover their capital costs. To do this, communication must be effective, frequent, and salient. EFC Research Assistant and UNC Masters of Public Administration student, Jordan Paschal, wrote a follow-up post that discusses what information governing boards are getting and what they need to approve a water rate increase. The Triangle: Best Place to Live, Work, Play… and Innovate for Water Quality Protection?